Saving toward retirement is a priority in many taxpayers' lives, but sometimes things happen to force you to dip into that money. Sometimes you just want to take a piece of it to make your life better. But when you take a distribution from your IRA, 401(k), or another retirement savings plan, you must generally include it as taxable income. The withdrawal may also be subject to an additional penalty tax up to 25 percent. 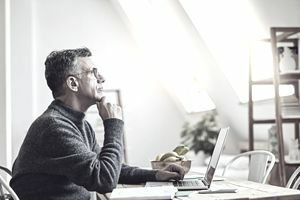 The penalty tax kicks in when you take a distribution before reaching a certain age, usually 59½, although there are some exceptions to this additional tax. The penalty is 10 percent of the taxable amount when you take an early distribution from an individual retirement account (IRA), a Roth IRA, a 401(k), a 403(b), or another qualified retirement plan before reaching age 59½. The taxable amount must also be included in your taxable income. The additional tax increases to 25 percent if you take the distribution from a traditional IRA within two years of the date you first began participating in the plan. There are two sets of exceptions to these rules. The first applies to individual retirement accounts, both traditional and Roth IRAs. The second affects 401(k) and 403(b) retirement plans. You had a "direct rollover" to your new retirement account using a trustee-to-trustee transfer. You received a payment but rolled the money over into another qualified retirement account within 60 days. You were permanently or totally disabled. You were unemployed and used the money to pay for health insurance premiums. You paid for college expenses for yourself or a dependent or a grandchild. You received the distribution as part of "substantially equal payments" over your lifetime. Qualified first-time homebuyers can take distributions of up to $10,000. You paid for medical expenses exceeding 10 percent of your adjusted gross income. The distribution represents a return of nondeductible contributions. It was a non-qualified distribution from a Roth IRA. Distributions that are made upon the death or disability of the plan participant. You were age 55 or over and you retired or left your job. You were age 50 or over and you retired or left your job as a public safety employee of a state government. The distributions were required by a divorce decree or separation agreement under the terms of a "qualified domestic relations court order." You received distributions of dividends from an Employee Stock Ownership Plan. They were recovery assistance distributions. They were qualified reservist distributions. They were distributions from federal plans under a phased retirement program. They were permissive withdrawals from a plan with automatic enrollment features. They were corrective distributions and/or earnings associated with excess contributions. You cannot have owned a home in the previous two years to qualify for the home-buying exclusion, and only $10,000 of the retirement distribution will avoid the tax penalty. You don't have to itemize on your tax return to claim the medical expense exception. What Are the Latest Rule Changes? Certain government employees can access their retirement savings starting at age 50 if they retire or leave their jobs rather than waiting until age 55. They include nuclear materials couriers, United States Capitol Police, Supreme Court Police, and diplomatic security special agents. This applies to distributions from governmental defined benefit and defined contribution plans for employees who separate from service after reaching 50 years of age. This change was made effective in 2016 as part of the Protecting Americans from Tax Hikes Act of 2015. You can figure the additional tax directly on your Form 1040, or you can use Form 5329. Your best option depends on your particular tax situation. Generally, you would calculate the additional tax penalty on Form 5329 if you qualify for one of the exceptions and your retirement plan did not report the exception on Form 1099-R in box 7. If the exception is properly coded in box 7 of your 1099-R form, you do not need to fill out Form 5329.